Twain scholar Michael J. Kiskis opens this fascinating new exploration of Twain with the observation that most readers have no idea that Samuel Clemens was the father of four and that he lived through the deaths of three of his children as well as his wife. 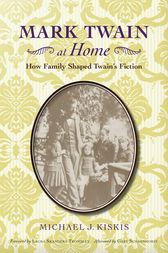 In Mark Twain at Home: How Family Shaped Twain’s Fiction, Kiskis persuasively argues that not only was Mark Twain not, as many believe, “antidomestic,” but rather that home and family were the muse and core message of his writing. Mark Twain was the child of a loveless marriage and a homelife over which hovered the constant specter of violence. Informed by his difficult childhood, orthodox readings of The Adventures of Tom Sawyer and Adventures of Huckleberry Finn frame these canonical literary figures as nostalgic—autobiographical fables of heroic individualists slipping the bonds of domestic life. Kiskis, however, presents a wealth of biographical details about Samuel Clemens and his family that reinterpret Twain’s work as a robust affirmation of domestic spheres of life. Among Kiskis’s themes are that, as the nineteenth century witnessed high rates of orphanhood and childhood mortality, Clemens’s work often depicted unmoored children seeking not escape from home but rather seeking the redemption and safety available only in familial structures. Similarly, Mark Twain at Home demonstrates that, following the birth of his first daughter, Twain began to exhibit in his writing an anxiety with social ills, notably those that affected children. In vigorous and accessible descriptions of Twain’s life as it became reflected in his prose, Kiskis offers a compelling and fresh understanding of this work of this iconic American author. Michael J. Kiskis was the coeditor of Mark Twain's Own Autobiography and Constructing Mark Twain. Gary Scharnhorst is the author of Bret Harte: Opening the American Literary West and the editor of Mainly the Truth: Interviews with Mark Twain. Laura Skandera Trombley is the author of Mark Twain’s Other Woman and Mark Twain in the Company of Women as well as a coeditor of Constructing Mark Twain.